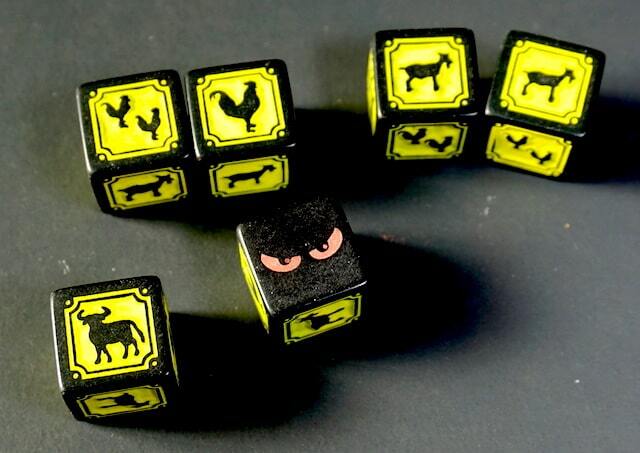 In Chupacabra: Survive the Night, you use your chupacabra dice to steal other players’ animals. Listen to our snap review in less than 5 minutes, or read on below. This review is of the second edition of Chupacabra: Survive the Night, published by Steve Jackson Games. The game was designed by David Blanchard, Brian Frodema, and John Jacobsen. Unlike other dice games published by Steve Jackson Games, Chupacabra: Survive the Night has no press-your-luck element. Instead, it is all about stealing other player’s dice. The player who ends up with all the dice is the winner. 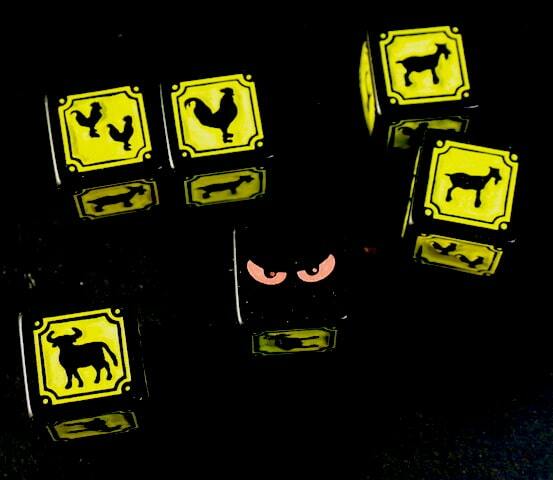 Each player starts with 6 identical dice; die faces are chickens, goats, cows, and scary red eyes representing the chupacabra! All players roll their dice simultaneously, then group them into “flocks” or “herds” based on what animals came up – place like animals together. Players who rolled any chupacabra get a chance to attack other players (in turn order). The chupacabra attack an entire herd or flock at once: 1 chupacabra can take down 2 chickens or 1 goat. It takes 2 chupacabra to take down a single cow. The “attacked” dice become part of the attacker’s dice pool for the next round. If a player’s chupacabra cannot take down an entire herd, they get nothing. However, if a player rolls ALL eyes it is “¡Chupacabra Loco!” Their chupacabra can take ANY flock or herd, no matter how large – but only one! The dice for Chupacabra are super cool – they glow in the dark! The gameplay is fast moving and heavily luck-based, so it’s easy for younger kids to play. We find it the most fun with 4 players. This is NOT a press your luck game; it’s just a fun way to roll dice and steal some. It’s an easy way to pass 10 minutes. But the glow in the dark dice elevate it a bit and make it a more fun experience. The Family Gamers received a review copy of Chupacabra: Survive the Night from Steve Jackson Games.